Google’s Android Nougat comes loaded with more security features than all the previous version. A lot has changed over the last 6 years in the Android world, security is one big chunk that has evolved a lot. 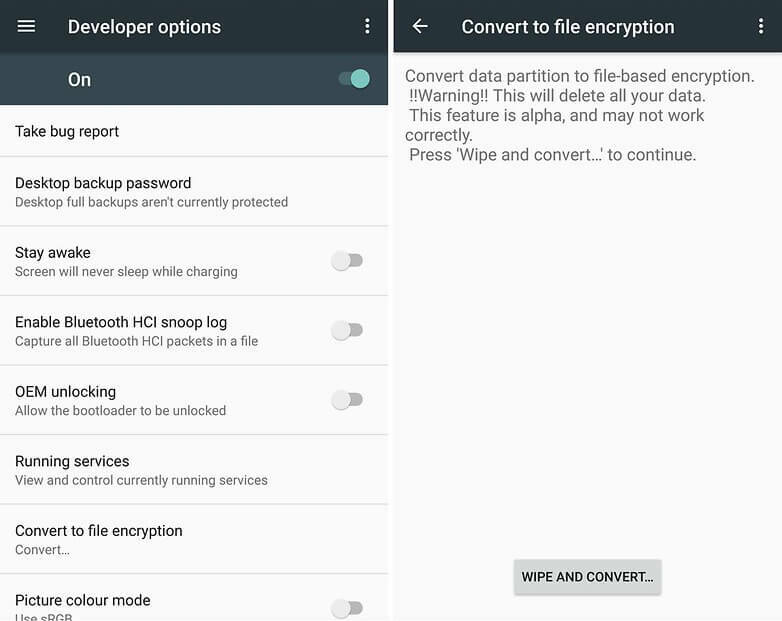 In the developer settings, you’ll find your file encryption. While it doesn’t sound like much, it has a number of positive implications. One of the most useful ones is that only your user data is encrypted. You do not need to enter your unlock pattern or PIN during the boot process. So if your smartphone should unintentionally restart, at least your alarm clock will still function and you won’t oversleep. Unfortunately, a full wipe is required in order to switch from full disk encryption to file encryption. While this is something I’d recommend for everyone, you’d be hard pressed to also setup a proper password, pin, or pattern. I’d recommend something that’s longer than 8 characters and that’s not a word found in any dictionary. What does that mean? Use an alphanumeric password with a combination of symbols. Although this might be a hard thing to remember for most, its also a good way to keep people out. If you absolutely need to use a “PIN”, then I’d recommend something complex with the maximum amount of digit permitted and set your device to wipe itself after 3 times. My favourite is the pattern password, I make use of every dot on that screen which is also setup on my own devices with a fingerprint reader making the access more convenient. Hopefully, your manufacturer or carrier is making good and keep the device software updated with the latest security fixes as Google intended.